Take for example the proposition in the title – that you, yes you dear reader – killed JFK on the fateful day – November 22, 1963 at Dealey Plaza in Dallas. All reading this could no doubt refute that claim. But those born after that date have a particularly easy and obvious piece of evidence that falsifies the proposition. The claim that they weren’t even born yet backed with a birth certificate to prove it. But to a conspiracy theorist – that wouldn’t matter. Since they are convinced of the truth of their proposition no evidence you present them will persuade them otherwise. They merely come up with a saving mechanism to make it appear their theory is still viable. This allows them to continue to hold on to their fantasy. Saving mechanisms are used regardless of how preposterous the saving theory is. In this case they might suggest your birth certificate was falsified and you’re really older than you claim. For someone committed to a theory (like a conspiracy theorist) such a person will always find a way to keep their pet theory alive regardless of the evidence. And so it is with atheists (and evolutionists I might add). Atheists claim there is no evidence for God. Yet this site and many other sites are filled with evidence for God. Indeed the entire creation is full of evidence. In fact, “The heavens declare the glory of God; the skies proclaim the work of his hands.” (Ps 19.1) Yet atheists will not acknowledge a single one. Not one. Is that because the evidence doesn’t exist? Or is it because they are committed to a theory that they refuse to let be disproved – like a conspiracy theorist? Of course atheists who are also evolutionists (that would be most of them since atheists need an origin story and of course deny the Biblical account) could make the same claim about creationists. For example: I as a creationist maintain there is no evidence for evolution. None. So atheists could claim I deny all the evidence they adduce for evolution such as the following. A supposed series of fossilized bones (nothing but fanciful stories). Microevolution (aka variation – which is true), which they claim proves macroevolution (molecules to man evolution) which is false. Analogous structures (from a supposed common ancestor – not from a common designer). The Miller-Urey experiment (which has been discredited – even among evolutionists) and so on. “…at present there is no naturalistic explanation, no natural cause that produces information. Not natural selection, not self organizational processes, not pure chance. 2. DNA consists of coded information. Evolution is incapable of creating the non-physical arrangement of information that is a code. So evolution can create neither information, nor the code under which and by which DNA operates. In other words – portions of DNA can code for one thing when read forward, and another thing when read backwards or from a different starting point. It can also be read by taking segments from multiple places – like folding the pages of a book together – and still arrive at an intelligible message (something you would not expect). DNA is obviously the product of a supremely intelligent mind. Clearly the random mutations and natural selection of Darwinian evolution are incapable of creating such a complex molecule that runs all living things. That proves evolution false. But that does not deter evolutionists. I’ll leave it to them to provide the saving device that allows them to keep faith in their disproved and clearly impossible theory. Observation #1: Evidence is not the deciding factor many think it is. If evidence were decisive, we’d all believe the same thing – precisely because it would decisively persuade us. But we don’t believe the same thing (obviously). So it’s not the decisive element many believe it to be. This is true because of the next observation. What determines the value of evidence? The evidence itself, or logical factors? If you said the evidence itself you’re mistaken. All evidence is subject to logical factors. Consider the title of this article: You (yes you dear reader) killed JFK. 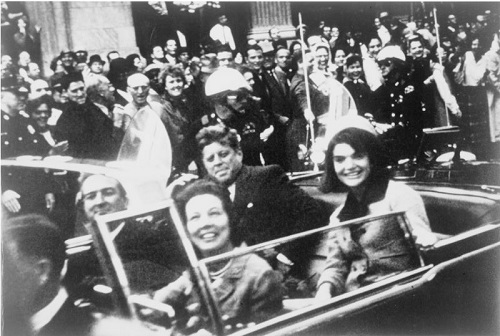 If that proposition is false (and I am quite confident you believe it is) then how much evidence do you expect anyone should find that you did in fact kill JFK? Zero. There should be no evidence of that claim. Furthermore I’m sure you’d agree that any evidence that is adduced is clearly being misunderstood, or is corrupt, right? So there are two general principles here: 1. Researchers of any topic should not expect to find evidence of something that is false. 2. If evidence is claimed to be found, but you know the proposition is false, you can confidently state the evidence is misunderstood or is in some manner corrupt (or both). This logical principle is employed by atheists and creationists alike. Atheists believe there is no God, and thus they believe there is no evidence of God. Creationists like myself believe evolution is false, it never happened, and thus there is no evidence of it. Thus for both groups any evidence that is produced must be either misunderstood or is somehow corrupt (or both). As an example in passing, this is why the soft tissue in dinosaur bones that kills old earth theory has not persuaded evolutionists and old earth believers that dinosaur bones are not 65 million years old. This leads directly to the next observation. This follows directly from the observation that all evidence must first pass a test of logical viability. The question then becomes – who determines what is viable? That depends on your point of view. A “point of view” in apologetic circles, is called a world view. Your world view determines how you view any evidence. For example: evolutionists like to make much of ape and primate bones. They line them up in a sequence which they claim shows evolution and a common ancestor. But logically speaking, that does not demonstrate evolution anymore than ordering pictures of different generations of airplanes demonstrates they evolved from a common airplane ancestor. (As opposed to being designed as we know they were as I demonstrate here.) Atheists and evolutionists think they’re looking at the evidence in an objective manner. They’re not. They cannot, they are bound to see things from their world view. They may change their worldview, but that simply means they will see things from a different vantage point – their new world view. This truth is put simply in observation #4. Observation #4: No one is objective. Everyone views all evidence from a point of view – from a world view. No one is “neutral.” That includes atheists, evolutionists, creationists, conspiracy theorists, and everyone else. All evidence is interpreted within the bounds of your world view. One cannot help but do so. Nothing is ever viewed in a vacuum. Your world view always colors your view of the evidence. Always. Anyone who tells you otherwise is either ignorant of the truth, or is lying to you. Observation #5: The persuasiveness of Evidence follows a willingness to believe. That’s why Jesus teaches to believe first, then you will have eyes to see the evidence. (Mark 9.23). The refusal to believe from the people of his day is why Jesus tells unbelievers they will be ever seeing, but never perceiving (or believing). (Mark 4.12). It’s also one (of a number of) reasons why Jesus refused to do miracles for an unbelieving generation. (Matt 16.4) It’s typically very clear when people are unwilling to accept a miracle – (in Jesus case) or evidence (in any case). The apostle Matthew records Jesus miraculously feeding 4,000 people (Matt 15.32-38). The very next chapter the (unbelieving) Pharisees came asking for a (miraculous) sign. (Matt 16.1) Jesus has just performed a miraculous sign – they don’t need another one. Another will not convince them. They need a change of heart, not another miracle. So it is with those who ask for more evidence of God – having already been given some. I list evidence for God in most of my articles. (For instance the DNA evidence listed above.) And yet atheists come asking for evidence. This tells me they don’t need more evidence -they just want another point to deny. As Jesus would not give unbelievers another sign (apart from the ultimate sign – the resurrection), I tend to decline giving such unbelievers another opportunity to mock and deny the obvious. The problem with bones and other lifeless items you dig up is they can’t tell a story or even how old they are – the person who finds them (or like minded scientists) makes up the story, and guess at an age. Not so with eye witness testimony. The eye witness testifies to what they saw. You either believe them or you don’t. Christians have plenty of eye witness testimony. There’s an eye witness to the Creation (Gen 1.1) There are plenty of eye witnesses to the resurrected Jesus. (1 Cor 15.5-8). You either believe them, or you don’t.No one ever has or ever will witness molecules to man Darwinian evolution. Evolutionists acknowledge that. But evolutionists are true believers in evolution, so that fact, and all the evidence against it doesn’t deter their firm belief. This is what makes atheism and evolution more like a religion than science – because it is based on an unfalsifiable (at least for the evolutionist) proposition. The universal experience of mankind is that complex items don’t construct themselves from random processes. It’s against our universal experience. It’s against the second law of thermodynamics. The fact that extremely complex creatures don’t simply manage to create themselves over time is simply Undeniable Furthermore no one ever witnessed molecules to man evolution happen. Yet evolutionists believe this is precisely how life came about. Again -ironic that they they claim to be the scientific, rational ones. There are a number of philosophical arguments for the existence of God. Among them: the Cosmological argument, the Ontological Argument, the Moral Argument, the Teleological argument and so on. These arguments are true regardless of your worldview. They can only be falsified by holding to preposterous propositions. And given observation 2, they take precedent over other types of evidence, because they are logical considerations which are prior to and paramount over physical evidence. Did you notice the common denominator of all these other types of evidences? They cannot not be convincingly refuted, so you either believe them or you don’t. It has almost nothing to do with evidence. It’s all about the willingness to believe. Jesus lamented those who were unwilling to believe (Matt 23.37) because he knew they were refusing the gift that would open the door to eternal life: belief in him. Where do you stand? Are you willing to believe? Or are you one over whom Jesus laments your unwillingness to believe? This entry was posted in Apologetics, Atheism, Complexity, Conspiracy Theory, DNA, Entropy, Evidence - Proper Use, Evolution, Evolution as Religion, Falsification, Gospel, Intelligent Design, Philosophy, Rational Thought and tagged John Sanford, Robert Carter, Stephen Meyer by Duane Caldwell. Bookmark the permalink.